Yay!! 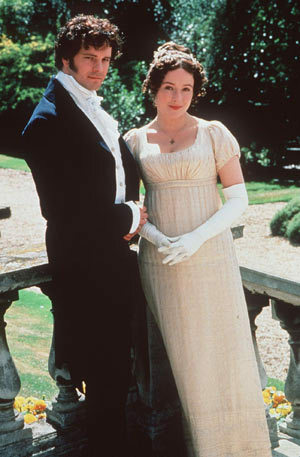 I love Regency clothes!! :) Be sure to follow the links and take a look at these beautiful doll clothes. Yesterday felt like Christmas again. 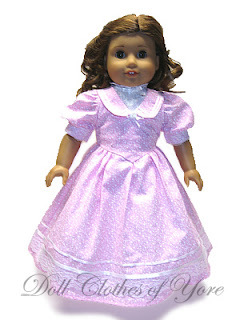 Both of the doll dresses I ordered with my tax return spending money came! :) I got some great pics that I can't wait to share with you. 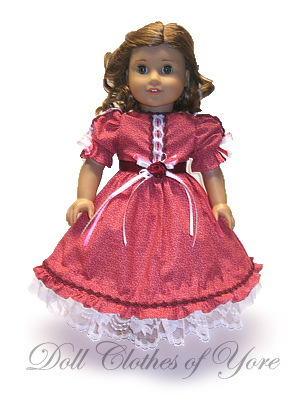 The dress came with soft, velvety shoes as well, but I think they were designed more for PBK's cloth dolls. They were way too big for my dolls. The dress itself was worth the great sale price, though. I tried the dress on Tess first, but then decided to try it on Emma as well. Tess's body is a lot thicker than an AG body, so I wanted to give an accurate picture of how it fit for all of you AG collectors. As you can see, it looks great on both of them. I'd really like to try this dress on Charlie. I think it would look great with her coloring. I didn't care for the bow in the center, especially since I wasn't expecting it, so I removed it and used it as a coordinating hair ribbon. It was well-sewn, but fairly easy to remove. I loved reading your answers to the questions! Finally, someone else who appreciates Raoul!! He was a bit silly in the book, but I did like him in the 2005 movie. Chauvelin is an excellent pick for most dastardly villain!=) He is quite creepy. Hi Tasha!! Thanks for commenting. I'm glad to find another Raoul fan!! 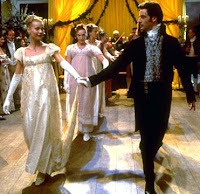 I loved Patrick Wilson's Raoul in the movie. I kept hearing comments about him being boring or wimpy, but I didn't think he was that way at all (although I wouldn't have minded if he'd had a haircut, personally). 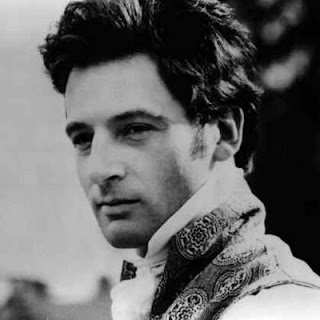 And because I was so disappointed at Gerard Butler's less than satisfactory singing pipes and over-sensual acting, it made Raoul stand out to me even more. Okay, I totally have to go off on a tangent here. 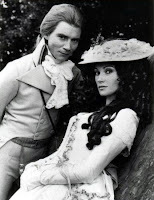 When I saw the play, to me what attracted Christine to the Phantom was his beautiful singing voice. With a voice like that, how could you not think there might be some goodness to him? When Gerard sang, he sounded angry and lustful. Not attractive at all, at least to me. Maybe I'm over-thinking this. Then again, when I read a story, I live it. I become the character and experience the story with them. So I have to be really cautious that I evaluate the feelings and emotions that the story makes me feel, and evaluate them in light of the truths of God's Word. Only then can I be balanced in my perspective. I agree - Raoul needs a haircut. lol. And I agree with you about the Phantom and why Christine was drawn to him, although I haven't seen the play. I've read the book though, and that's what I got from the book. 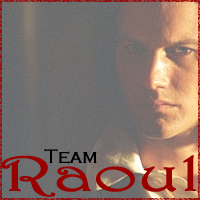 On her blog post, Tasha made these "Team Raoul" or "Team Phantom" buttons you can add to your own blog. So, as you can probably tell from the above comments, my vote is for...Raoul. I'll admit it: I was completely obsessed with "The Phantom of the Opera" in high school. I read the book, saw the play twice and had the full soundtrack, which I'd practically memorized. I mean, it's kind of a "Beauty and the Beast" type story, in some ways. Although Erik is not quite as beautiful on the inside as the Beast, in my opinion. One of my fondest memories regarding Phantom was my senior year of high school, when my friends all pooled their money together to buy me a ticket to see a production of Phantom in San Francisco! :) It was one of the most amazing birthday gifts ever!! I dreamed of how fun it would be to play Christine, although I knew it would never happen, because I refused to sing "Past the Point of No Return" for its suggestive lyrics. I fast forwarded that song every time I listened to the CD, because I didn't want those words and thoughts to have a prevalent place in my head. So many people love "The Phantom of the Opera", especially Andrew Lloyd Webber's version. It seems that the majority of Phantom "phans" love Erik (the Phantom) best of all. And I'll admit, hearing Michael Crawford's version of the Phantom singing to me over my CD player made me completely understand why he was so attractive to so many women. That voice!! How could anyone who sang like that be completely bad? And hey, he eventually let Christine and Raoul go free, so that was a good thing. I agree, it's one of the most touching parts of the story. Sitting in the audience in San Francisco, watching the unmasked Phantom sitting in a dejected heap in his lair, calling pitifully, "I love you...I love you..." after Christine, I bawled my eyes out! But let's not forget folks, he was a murderer and at least partially insane. I can remember someone telling me, "If everyone would have just done what the Phantom wanted, it would have been okay. He would have been a nice guy if people would have just listened to him." This came from an adult. I had to strongly disagree with that statement (although I wasn't brave enough to say so at the time). Yes, Erik had a horrible life of mistreatment and misunderstanding. The things that happened to him should never happen to any human being, and the people who mistreated him should be held responsible. Yet, at the same time, we can't blame our circumstances for our actions. We alone are responsible for our own actions, no matter what others have done to us. And even if everything had been done Erik's way, he may have come up with more and more demands to keep him happy and keep others from trying to take Christine away. Eventually, someone would have had to stand up to him. The older and (hopefully) wiser I get, the more I realize the advantages of the safe, steadfast love of the more "boring" guy like Raoul as opposed to the thrilling, dangerous love of Erik. [Side note: I don't think Raoul is boring, that just seems to be the popular opinion.] There is something about danger and passion that excites our human nature. We are attracted to the mysterious and seductive. This kind of love may make for a good story, but in real life it can be disastrous. [This paragraph is somewhat repetitive if you read the above comments, but bear with me.] :} "Come on, it's just a story," you may say. "Aren't you overreacting a bit?" Perhaps. But how many of us find ourselves wrapped up in the stories we read, so much so that we look for a human version of our fictional hero? As women, most of us are extremely emotional creatures. Emotions aren't bad, just as long as we balance them out by using our heads every once in a while. :) I know that I often find myself led or carried away by my emotions if I'm not careful. When we fill our heads with the Eriks, the Edward Cullens, and the Jacob Blacks of literature and movies, what kind of men are going to attract us in real life? How many women have gotten into a relationship with someone thrilling and brooding and ended up in an abusive or otherwise heartbreaking relationship? I even find myself having to be careful filling my head with too many good guys. With all of the Mr. Knightleys, Mr. Darcys, Raouls, Sir Percy Blankneys and all those others, I think our real life guys find it hard to compete. There's nothing wrong with a good story now and then, especially one that's well-written and uplifting. But how can we be content in our real life if we're constantly looking for the thrill of our romantic stories? The point is, you're never going to find the perfect man on this earth. We all have aspects of our personality that need work and annoy others. Then again, I believe it's important to watch for character traits in a person you're attracted to. Watch how he responds in a tense situation. Does he handle things calmly, or blow up and throw a fit? Does he treat his mother with kindness and respect? How does he react around kids? Will he make a good daddy someday? Does he spend all of his time playing computer games or the Wii, or does he reach out to others around him? 'Cause let me tell you, he's not going to change once you're married. If anything, he'll do less than he does now because he's tired and worn out from providing for the family all day. What you see is pretty much what you will get. Make sure you can live with what you see. Okay, I guess that's enough free relationship tips for the day. ;) As a side note, I don't listen to or watch much of Phantom anymore. There was a point in my past where "The Phantom of the Opera" was too important to me. It became the only thing I could think about. Nothing should be that important to me except Christ. So, I gave it up completely for a time. I still listen to it every once in a while, and I've watched the movie once or twice. I can't fully recommend the movie for sensuality and some violence. If you're going to see Phantom and have the chance to see the live stage version, it's waayyyy better anyway!! :) I do try to be careful not to be too obsessive anymore, though. So, how about you? Team Raoul or Team Erik? A Blog Party Event from "A Maiden's Musings"
-What, to you, forms the essence of a true heroine? A true heroine is a woman who desires to do the right thing, no matter how hard it may be. 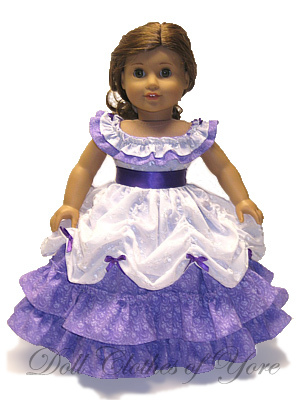 When I was younger, I preferred the heroine who always seemed to make the right choices in every situation. As I've gotten older and come face to face with many of my flaws, I appreciate the heroine who is not "perfect", but learns from her mistakes and is a better person because of what she's learned. I also appreciate characters that I can look up to as role models for behavior, young women that portray Christ-like qualities in their lives. -Share (up to) four heroines of literature that you most admire and relate to. I appreciate and admire Elinor for her self control and selfless behavior. Throughout the novel, she is surrounded by hardship. Her father dies when she is still a young woman. She loses her home to uncaring, selfish relatives. Her chance at happiness is ruined when she finds out the man she loves is engaged to a jealous, conniving woman. She is constantly belittled, insulted and misunderstood. Yet through it all, she remains calm and poised, the glue that holds her grieving family together. I know for a fact that I would respond in a much less dignified manner to only half of what she endured. I admire her for her selfless love for her mother and sisters, and her constant love for Edward, even when it seems they will never be together. She admires him for standing by his promise, even though it means sacrificing her happiness. In the end, thankfully, her patience and selflessness is rewarded. 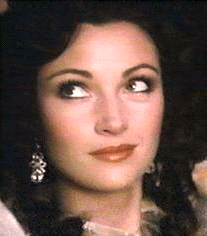 The beautiful French wife of Sir Percival Blankney, Marguerite seems to have it all. But a careless decision on her part leads to alienation from her beloved husband, blackmail, and betrayal. Marguerite is a woman with definite flaws (especially in the book, less in the film and play versions of this story), yet once she realizes her mistakes, she does everything in her power to save the life of her noble husband. I appreciate her determination and love for her husband, love that makes her willing to risk everything to save him, even if it means losing her life. I've read the book by Baroness Orczy, seen the film version with Anthony Andrews and Jane Seymour, and seen the Broadway play (though not in New York). And while I can't fully recommend all of these for swearing and some sensuality, I greatly appreciated the story. Each version is so different that they are hard to compare to each other. But the same themes of bravery, loyalty, and sacrificial love are prevalent in each one. While Emma is not necessarily a heroine you can look up to for much of her book, I can definitely relate to her. :} Emma has good enough intentions, but she is so caught up in her plans of marrying everyone off, that often she is clueless to what is really happening around her. 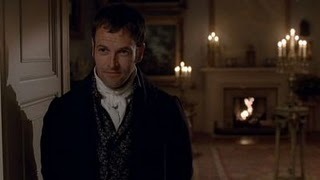 She also tends to need to vent (which, I must confess, is one of my shortcomings as well), much to the chagrin of Mr. Knightley. She can be a bit proud, haughty and misguided in her actions and choice of friends. 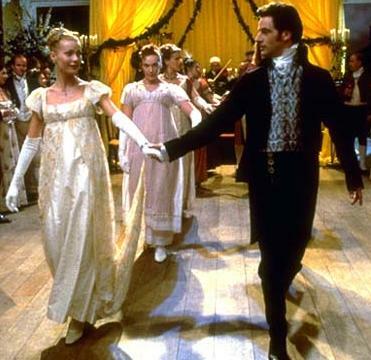 Yet through various events in her life (and the helpful prodding of Mr. Knightley), Emma begins to see her flaws and realize the error of her ways. Ultimately, her mistakes and the things she learns from them help her to grow into a kinder, more thoughtful woman. Coral is the beautiful middle daughter of a wealthy English lord who owns a silk plantation in India. In the books we see her grow from an unwell yet determined 16 year old girl to a strong young woman, with a passionate desire to reach the Untouchables of India with Christ's love. While Coral's impetuous behavior often get her into sticky situations, especially when English and Indian cultures clash, she has a heart for the Lord and a desire to serve Him with her life. She adopts a motherless Indian child and loves him as if he were her own son. When Gem is kidnapped, she does everything in her power to save him, often risking her own safety to do so. Throughout her search for her missing son and her mission to share Christ with the people of India, she shows an unswerving faith in God and a determination to do what she believes He has called her to do. -Five of your favorite historical novels? -Out of those five books who is your favorite character and why? -If you were to plan out your dream vacation, where would you travel to - and what would you plan to do there? I would most likely go to England, France, and Israel. I'd start in England, where I would see some of the historical sites where Jane Austen lived and where her stories took place. Then I'd go to France, stop by the Paris Opera to see if I could find the Phantom of the Opera, ;) and then find a copy of "Beauty and the Beast" in French to add to my collection. I'd finish with a trip to Israel, seeing all the places where my Lord walked and talked during His earthly ministry. -What is your favorite time period and culture to read about? -You have been invited to perform at the local charity concert. Singing, comedy, recitation - what is your act comprised of? -If you were to attend a party where each guest was to portray a heroine of literature, who would you select to represent? I would most likely go as Emma Woodhouse or Catherine Morland, just because they remind me so much of myself. -What are your sentiments on the subject of chocolate? -As a small, imaginative, red-haired damsel might query; would you rather be divinely beautiful, dazzlingly clever, or angelically good? Why? -In which century were most of the books you read written? -Describe your ideal dwelling place. -Have you ever wanted to change a character’s name? I'm sure I have in the past, but nothing comes to mind at the moment. 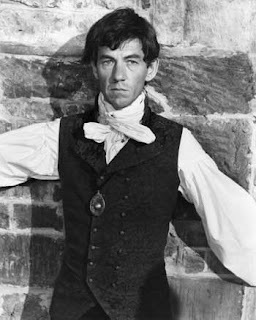 One villain that really stands out to me is Chauvelin from "The Scarlet Pimpernel". He is so cold, calculating and unfeeling in his pursuit of the Scarlet Pimpernel. He will destroy anything or anyone who stands in his way. His dealings with Marguerite are extremely lustful and manipulative. To put it in the modern vernacular, he's just downright creepy. In all three versions of this story that I've read/seen, Chauvelin is completely despicable. -Your duties met for the day, how would you choose to spend a carefree summer afternoon? -Create a verbal sketch of your dream hat - in such a way as will best portray your true character. -Share the most significant event(s) that have marked your life in the past year. One of the first significant events that comes to mind is my younger brother's wedding. It was such a joy to watch him get married to the woman he's loved for years. I'm so thankful for my wonderful new sister! :) Another significant event was getting involved in my local Christian writer's group again. It really inspired me to get back into my writing and ultimately led me to starting this blog. I'm sure there are other significant events, but these are the two that stick in my mind right now. -Share the Bible passage(s) that have been most inspiring to you recently. "For consider your calling, brethren, that there were not many wise according to the flesh, not many mighty, not many noble; but God has chosen the foolish things of the world to shame the wise, and God has chosen the weak things of the world to shame the things which are strong, and the base things of the world and the despised God has chosen, the things that are not, so that He may nullify the things that are, so that no man may boast before God. But by His doing you are in Christ Jesus, who became to us wisdom from God, and righteousness and sanctification, and redemption, so that, just as it is written, Let him who boasts, boast in the Lord." -And lastly, as I am a rather businesslike hostess, may I ask you your views regarding those adorable little items - namely pin back and mirror back buttons? 1). Where would you choose to display a button badge to best showcase your unique style? 2). What image and/or sentiment would most make you smile were it inscribed on your very own compact mirror? 2. I would love to see an image of any Jane Austen heroine, especially Lizzy Bennett, Emma Woodhouse, Catherine Morland, or Elinor Dashwood. I'd also love a button with Psalm 19:14 printed on it: "Let the words of my mouth and the meditations of my heart be acceptable in your sight, O Lord, my Rock and my Redeemer." I love Celtic style dresses like this one. My hubby pointed out that this would make a good dress for Eowyn from the Lord of the Rings. 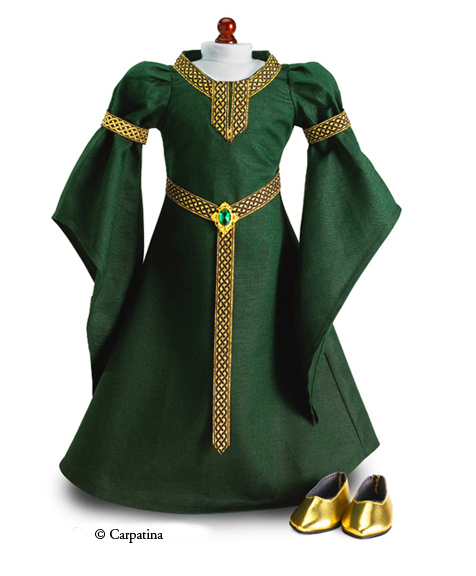 Maybe Maggie will end up with an Eowyn dress instead of an Arwen dress. :) Eowyn's personality is a little more like Maggie's than Arwen's anyway. It was such a beautifully done Regency dress. I've been looking for another Regency gown for my Emma doll, since she's another Jane Austen fan. The dress was even called the "Emma Woodhouse" dress, and Emma Woodhouse is who my Emma is named after! It was the very last one, not to be reproduced. I just couldn't resist!! It was too perfect. I ordered it yesterday, and it should be here within a week. Yay!! There are so many other beautiful gowns on the site. 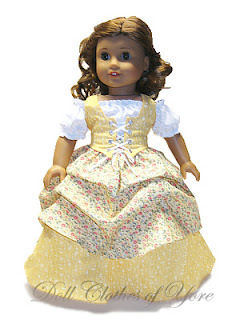 Emily Marsh, who makes and sells all of the doll clothes, has a creative site with a great selection of dresses from different time periods. 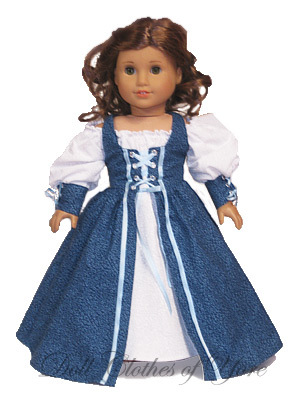 Many of the dresses are named after historical or literary characters. 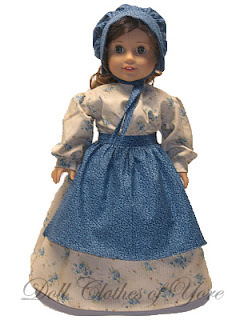 And to add to the fun, you can click on the word "History" next to each dress and get some historical facts about the dress and the time period it is from. Emily also has a blog. 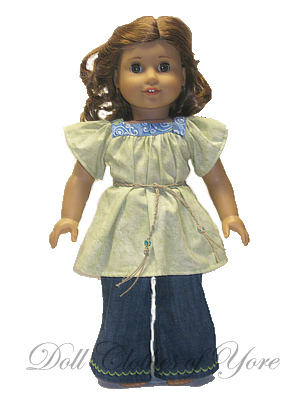 You can find the link on her Doll Clothes of Yore homepage. Another beautiful Renaissance dress. I love the blues in this one. 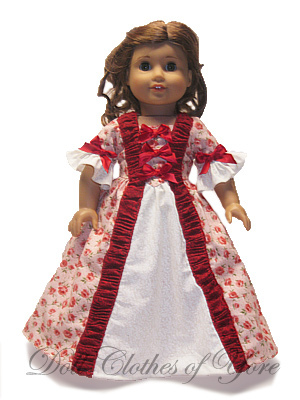 The above dresses are just two examples of some of her lovely dresses from the Colonial period. These would make great extra gowns for Elizabeth or Felicity. 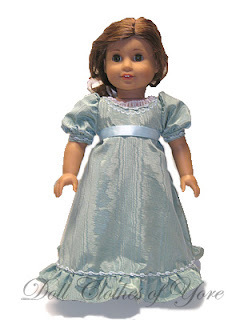 This dress is based off of the dress that Diana Barry wears to the Sunday Picnic in the TV miniseries of "Anne of Green Gables". There are lots of other great outfits to see, so stop by Doll Clothes of Yore and see them for yourself! President's Day Sale at Pottery Barn Kids! Hi everyone! Just wanted to let all of you know that Pottery Barn Kids has a great sale going this weekend. 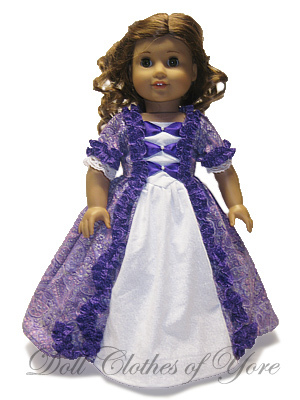 They have several beautiful dresses for 18" dolls on sale, starting at $16.99, with free shipping! 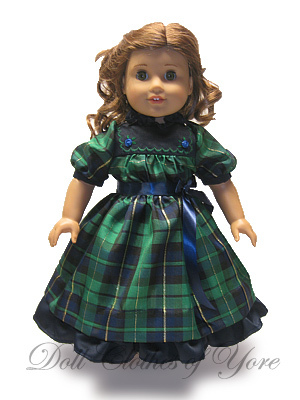 I just ordered the plaid holiday dress. :D Just wanted to pass the news along to all of you. I've included a direct link HERE. Happy shopping!! Here, as promised, are a few pics from my daughter's birthday. We had a great time, despite some last minute illness and craziness. My aunt, who normally helps my mom make the cakes, ended up getting sick the day before "cake day", so my sister-in-law helped with the cake instead. We all assumed my daughter would want a purple cake, since purple is her favorite color and Plum Pudding is mostly in purples. But a week or so ago, she informed us that she wanted a pink cake with three layers and with chocolate covered cherries on it. So, that's what my mom did! :) It turned out a lot brighter pink than she wanted (these pictures tone the color WAY down), but it was still really cute! The girls didn't cough nearly as much that day, and most of my daughter's friends got to come. I was so relieved. It was a good turn out...just a big enough group to feel well attended, but not so many people that it felt overwhelming. All the little girls LOVED their special necklaces from Jess at Factory Twenty9, along with their other goodies. Sorry, I didn't get any good pics of the girls with their necklaces...it was a little crazy! The cake with all of the goodie bags behind it...this is a little closer to the actual pink. :) The figurines in front of the cake were added by my daughters as extra decorations. And the special dark Hershey's kisses were also my daugher's special request. A Few Updates and Birthday Craziness! Last Day to Enter My Valentine's Day Giveaway!